Start off your visit on the 3rd (Mon): explore and take pictures at Eiffel Tower, wander the streets of Trocadero, then admire the landmark architecture of Cathédrale Notre-Dame de Paris, and finally step off the mainland to explore Ile Saint-Louis. 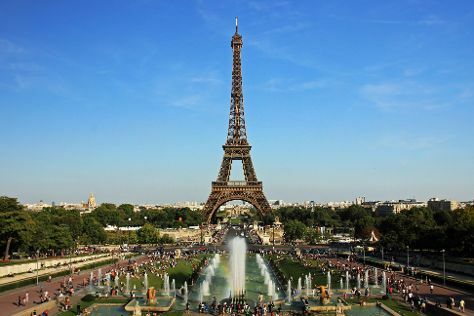 To see photos, traveler tips, where to stay, and other tourist information, you can read our Paris trip planner . Florianopolis, Brazil to Paris is an approximately 17.5-hour flight. You can also do a combination of flight and shuttle; or do a combination of flight and train. Due to the time zone difference, you'll lose 4 hours traveling from Florianopolis to Paris. Traveling from Florianopolis in February, expect Paris to be cooler, temps between 9°C and 1°C. Finish your sightseeing early on the 4th (Tue) so you can take a train to Amsterdam. On the 4th (Tue), explore the world behind art at Van Gogh Museum and then enjoy the sand and surf at Strand Egmond aan Zee. Keep things going the next day: admire the masterpieces at Rijksmuseum, then wander the streets of The Jordaan, and then take an in-depth tour of Anne Frank House. To find traveler tips, maps, other places to visit, and other tourist information, read our Amsterdam visit planning site . Traveling by train from Paris to Amsterdam takes 3.5 hours. Alternatively, you can fly; or drive. In February, plan for daily highs up to 7°C, and evening lows to 0°C. Finish your sightseeing early on the 6th (Thu) so you can travel to Venice. Kick off your visit on the 6th (Thu): wander the streets of Cannaregio, contemplate the waterfront views at Canal Grande, then contemplate the long history of Doge's Palace, and finally get to know the fascinating history of St. Mark's Square. For ratings, photos, and tourist information, refer to the Venice trip planner . You can fly from Amsterdam to Venice in 5 hours. Other options are to do a combination of flight and train; or drive. Traveling from Amsterdam in February, expect nights in Venice to be about the same, around 3°C, while days are somewhat warmer, around 11°C. Finish your sightseeing early on the 7th (Fri) to allow enough time to take a train to Florence. Start off your visit on the 7th (Fri): contemplate in the serene atmosphere at Cathedral of Santa Maria del Fiore, admire the masterpieces at Uffizi Galleries, make a trip to Piazzale Michelangelo, then take some stellar pictures from Basilica San Miniato al Monte, and finally snap pictures at Ponte Vecchio. Keep things going the next day: see the interesting displays at Academy Of Florence Art Gallery, do a tasting at Castello del Trebbio, and then do a tasting at Castello di Nipozzano. To see other places to visit, traveler tips, more things to do, and tourist information, refer to the Florence holiday planner. Traveling by train from Venice to Florence takes 2.5 hours. Alternatively, you can drive; or take a bus. In February, daytime highs in Florence are 14°C, while nighttime lows are 5°C. Wrap up your sightseeing on the 9th (Sun) early enough to take a train to Rome. Start off your visit on the 9th (Sun): explore the ancient world of Colosseum, take a stroll through Trastevere, then pause for some serene contemplation at Chiesa di Sant'Ignazio di Loyola, and finally explore the world behind art at Galleria Borghese. On the 10th (Mon), you'll have a packed day of sightseeing: contemplate the long history of Palatine Hill, make a trip to Trevi Fountain, admire the landmark architecture of Pantheon, then stroll the grounds of Catacombe di San Callisto, and finally pause for some serene contemplation at San Pietro in Vincoli. To see reviews, more things to do, traveler tips, and more tourist information, read our Rome trip planning website . Traveling by train from Florence to Rome takes 2 hours. Alternatively, you can drive; or fly. February in Rome sees daily highs of 16°C and lows of 5°C at night. Wrap up your sightseeing by early afternoon on the 11th (Tue) to allow enough time to travel back home.